Ring ouzels (Turdus torquatus) are associated with wildness.They live in Britain’s far flung places, amongst mountains and crags, their plaintive song complementing the high and lonely spots they make their home. Every year they turn their back on winter sun in the Mediterranean, and head for their rugged outposts in the British Isles from mid-March onwards, before chasing the sun again in September and November. Populations live in Yorkshire, the Peak District, Scotland, Cumbria, Dartmoor and North Wales. They have been found in significant quantities in Snowdonia, including on Cadair Idris, sharing the view of the heavens with the ancient warrior giant. Ring ouzels are closely related to blackbirds, and their Welsh name mwyalchen y mynydd translates as ‘blackbird of the mountains’. Slightly smaller and slimmer than blackbirds, ring ouzels are distinctive for their eponymous ‘ring’, the white crescent on their breast. Males are black with a lighter wing panel due to its white feather edging. Females have similar colouring, but are duller. Juveniles are brown and younger birds often lack the white bib. The ring ouzel is red listed after a dramatic decline over the last thirty years. It has been difficult to pinpoint exactly why there has been such a fall in numbers but climate change, habitat destruction, damaging farming practices and breeding disturbance are possible reasons. Their breeding sites may be remote, but unfortunately their breeding season clashes with people using mountainous places recreationally in the warmer months, and this disturbance could affect their numbers. Recent studies suggest that low first-year survival is contributing to their decreasing numbers, with some evidence to suggest that adult survival is also low. 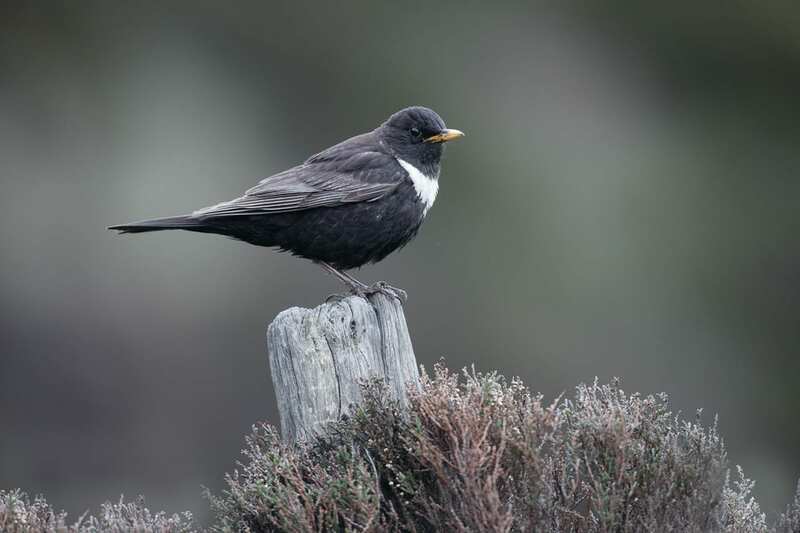 Ring ouzels are particular when it comes to choosing their nesting sites, and setting up home in craggy areas, gullies and mountainsides afford them protection from predators like weasels and stoats. Mountainous shrubs, such as bracken, heather and bilberry provide both protection and good feeding spots for their young. Short grasses are good foraging grounds for finding insects. Ring ouzels live mainly on beetles and worms, but also eat small mammals and reptiles, and berries provide an important food source for the later summer and autumn months when they are fattening up ready for their long flight south. Males are the first to migrate back to the UK, choosing their territories before the singing begins in earnest to attract a mate, the lively hum of spring activity offset by their mournful warbling. They lay several pale-blue eggs, mottled with brown, in a cup-shaped nest. When not paired for breeding ring ouzels generally remain solitary, a territorial bird that may sometimes assemble into flocks to migrate, or loosely share feeding grounds with other ring ouzels and different birds. As ring ouzels remain in decline, it is imperative that habitats they can thrive in are restored and protected. We hope to see a return of this charming bird, and hear its melancholy song in the craggy heights of the Cambrian Mountains.